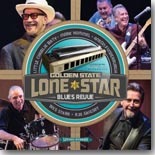 The blues supergroup headlined by Mark Hummel, Anson Funderburgh & Little Charlie Baty collaborate for this month's Pick Hit in Golden State Lone Star Blues Revue. Our Surprise pick this month features the newest CD, Truth, from Chicago guitarist Guy King. This month's Flashback feature, Alligator's tribute album God Don't Never Change, includes all new recordings by current artists of classic "old school" blues and gospel recordings from Blind Willie Johnson. Our What's New section features reviews of new CDs from Toronzo Cannon, Too Slim & the Taildraggers, Anni Piper, Luther Dickinson, The Riff Riders, Van Wilks, Dennis Jones, Brothers Brown, Waydown Wailers, Kelly Richey, and more.